Moto3 started proceedings in Phillip Island with a battle so tense it needed a photo to confirm Alex Rins as the winner by just +0.003 from second placed Maverick Vinales. There were six riders still in contention for the win on the final lap. Luis Salom’s excellent timing deserted him for a change leaving him to fill the final podium spot and cutting his championship lead to just five points. Alex Marquez made great progress for fourth after qualifying down in 13th, especially after being hit by Miguel Oliveira on the opening lap. Jack Miller gave the home crowd something to cheer with a fifth place finish, having been as high as second in the closing stages. Jonas Folger was the last of the leaders, taking a sixth place finish for Aspar. Efren Vazquez caught and passed Niccolo Antonelli aboard his Mahindra for seventh with the Italian crossing the line in eighth. Zulfahmi Khairuddin returned to action on his 22nd birthday after ahving to sit out his home race in Sepang for a 11th place finish. The remaining points went to Jakub Kornfeil in 12th, Isaac Vinales in 13th, Romano Fenati in 14th and Brad Binder in 15th. Brit John McPhee finished the race in 17th. 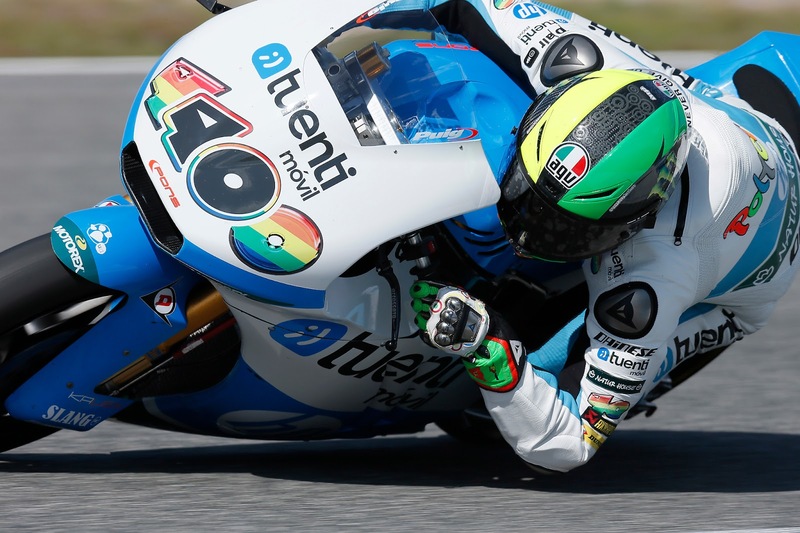 Moto2 had been reduced to a thirteen lap sprint, which was won by Pol Espargaro in his fifth win from pole of the year. The shortened distance meant he could not vanish into the distance as he did around the Island last season, but his win means he needs to only finish on the podium with Redding absent in Motegi to take the title after moving into the lead by 16 points. Tom Luthi gave him his main opposition for the win but a mistake in the closing stages forced the Swiss rider to settle for second. Jordi Torres completed the Podium in third after battling past Alex DeAngelis. The rider from San Marino was also passed by Simone Corsi for fourth, eventually crossing the line fifth. Sixth went to Dominique Aegerter, his 31st successive points finish with the lone Marc VDS machine of Mika Kallio in seventh. An early mistake by Tito Rabat, running wide across the grass left him out of the battle for the win in ninth. Ant West came from 19th on the grid to take tenth. Sandro Cortese finished 11thahead of Ricky Cardus in 12th. British riders Danny Kent and Gino Rea both found themselves in the points in 13thand 14th respectively. The final point went to Doni Tata Pradita his first point in Moto2. Previous Previous post: Brookes secures second win of 2013 "I felt comfortable, found a rhythm and could ride fast"